A few days ago, I received an email from my local comics shop, Comicopia and I noticed that the 16th & final volume of Jojo’s Bizarre Adventure was on the listing. For those of you who don’t know me, this is one of my favorite series and I’ve realized over the past few years of reading the American release (and some of the scantalations), that not a lot of people know about it. Heck, even the people at Comicopia only had a vague idea about what the series was about. So I thought, in this post, I would share with you reasons that I love the series and hopefully prompt you to check out this marvel of Manga entertainment. Just a quick recap of the story: The story of JoJo’s Bizarre Adventure centers around the misadventures of the Joestars, a family of powerful, honest and generally good-natured people, whom attract the most peculiar friends, foes and situations. 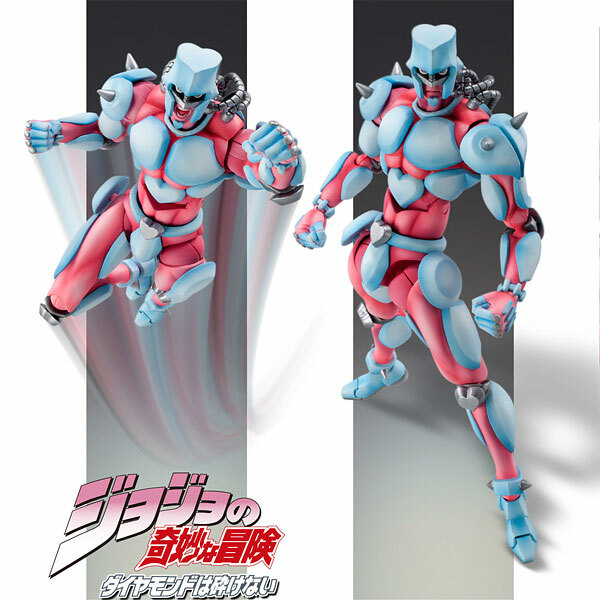 The series spans several generations, with each part featuring a descendent of the Joestars as the main protagonist along with a large cast of characters. Viz has published the third installment in the series, following Jotaro Kujo, his grandfather (hero of the previous installment) Joseph and friends as they battle a vampire named Dio that has plagued their family for the past century. This is the series that also introduces the concept of Stands, which stays throughout the rest of the series. 1. It is exceedingly violent in the best way possible. Do you like it when your hero punches their villains through the teeth? Do you enjoy giants rats, people getting pulled into bottles and strange, carnivorous floating heads? Do you enjoy it when characters go to the extreme to win a fight, sacrificing their own limbs to win? Do you find that normal action manga *cough* Naruto *cough* Bleach* just isn’t enough to satisfy? Then this might be the series for you. Jojo’s is violent, more so than most comics, but it is all part of the ridiculous and over the top style. 2. 80s and 90s pop culture references. I know I’ve mentioned this before but this is something I love about the series, the music and occasional art references. It is another fun element to the series; I make a game out of trying to find the references. There is also something just amazing about the influence music can have over visual artists, especially in comics, even if it is just mostly name-dropping. This installment contains mentions of the Beatles Rubber Soul, Kenny G, Vanilla Ice, Pet Shop Boys, Mariah Carey, The Police, Muddy Waters among many others. Unfortunately, this fact may be part of what is keeping the US from publishing more of the series, as Araki’s frequent references to Western music may violate American copyright laws. 4. Creativity in creating abilities. I’ve fantasized about superpowers. In all honesty, who hasn’t at some point in their life? Araki definitely has and he brings that fantastical thinking out in full force. I really love the idea of Stands because it reminds me so much of X-Men. Their are only a lucky few who do have this extraordinary ability and its tied so tightly to their personalities quirks and traits to it is this beautiful exercise in character writing. Araki also is able to utilize alluring pieces of culture around him to create something extraordinary. The entire cast of Stands from the third installment was based on of Tarot cards, which propelled me to further investigate the meanings behind the cards. 5. It is just a fun series. The books are a quick read but I always feel satisfied afterwords. This is definitely a guilty pleasure series for me but deep down, I feel as though Jojo and Hirohiko Araki have an important place in the scope of Manga. It is a real shame that Viz doesn’t have plans to publish the rest of the series but I implore you to check out what is available out there. “Purple Haze” by Jimi Hendrix is undoubtedly his most well-known song. The song was recorded and originally appeared on Hendrix’s 1967’s album Are You Experienced. Hendrix claimed that the song is based on a dream of his (as is most of his music) where he is lost underneath the sea, aimlessly wandering. This song has also been linked to a variety of Drugs, including LSD in a purple capsule form and certain Marijuana strains. Hendrix has also been noted as stating that the song is a reference to a science fiction story. Purple Haze had a rather short run in the series, showing up in the background but mainly in a fight with antagonist, Illuso and his stand, Man in the Mirror, early on in the series. 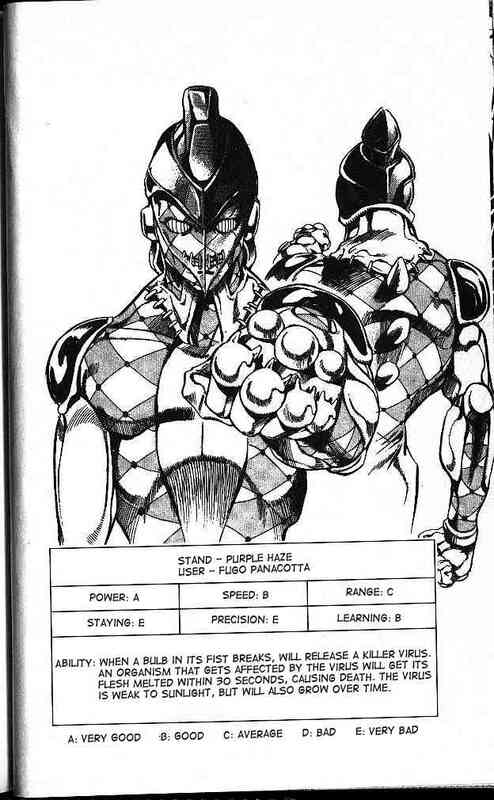 During the fight, we learn of Purple Haze’s frightening ability; on each of his hands are three bulbs, each of which contains a dangerous airborne virus that causes flesh to melt. While this may seem like an extremely useful weapon, Purple Haze cannot differentiate between friend or foe, endangering all life around him. On top this, Fugo has an incredibly difficult time controlling this Stand, as it is quite unstable and has a hair-trigger temper. This later became part of the reason why Fugo/Purple Haze was written out of the story, as Araki felt he had made him too powerful of a Stand and couldn’t be used effectively in the story. There is certainly a connection between the song title and the dynamics of the ability. Viruses are often described as airborne particles (especially emphasized on their appearances during air travel), which is the method that Purple Haze uses to spread its virus in the comic. The word, Haze represents a natural phenomenon where airborne particles, including dust and smoke, alter the clarity of the sky, often obscuring the sunlight so that connection is obviously clear. As the comic isn’t printed in color and the Stand never appeared in any colored pages (although the character and the virus appeared in darker screen tone), it is impossible to fully make a connection with the designated color Purple. When Araki normally assigns a color to a Stand’s name, it is evident in the appearance and design of the Stand (for example, Hierophant Green shoots Emeralds), which suggests that Purple Haze was used more as a name alone than an actual creative influence. There is an interesting disconnect between the two in the origins and intentional meanings of the song, which is supposed to be representative of a dream-like or drug induced state and the temperamental & violent nature of the Stand. There is, however, a connection in the lyrics despite these perceived differences. Many of the lyrics (Purple haze all in my brain, Purple haze all around) suggest a confused mental state, due to the interaction with the Haze, which can be attributed to the unfocused nature of the Stand. He can’t seem to tell the difference between friend or foe, despite his user’s best attempts. The lyrics also, however, are a literal cry for help in escaping this confused state. This can also be attributed to an aspect of the Stand, its user Pannacotta Fugo. Fugo is well aware of his Stands inability to perceive friend from foe and he has to warn his teammates during his fight, making him the voice crying out from the confusion. Aside from the associations with drugs, Araki was able to understand and utilize some core ideas of the song, making them into a semi-interesting character. Though never fully developed enough for us to care about him, Fugo and Purple Haze represented something that Araki hasn’t really shown us before; a character with an imperfect control over his Stand, as most of the Stand Users in the series have always had a mastery or at least intense control over the abilities they wielded. Coming up next is Purple Haze’s opponent, Man in the Mirror! Derived from the term, “one who stands by me”, Stands are a manifestation of one’s psyche and control over our innate power. Only those with unusually strong spiritual power and determination can produce stands, as they reflect our true values, whether they be of good or evil intention. Stands, in some instances, can be developed by way of using an external tool to bring them out, (the Bow and Arrow in series Four). If a person cannot physically or willingly handle the emergence of a Stand though, they will die. Families, like the Joestar’s, that have a unique history of Stand Users often produce offspring with Stands that automatically function, without having to be awakened. There have also been instances of Stands being produced artificially by other stands (Whitesnake in Series 6 is able to take others Stands and insert them into non-User via discs). Stands retained a Humanoid appearance at first introduction in Series 3 and mostly consisted of using elemental abilities, such as Fire, Plants and Water, as well as more simplistic abilities. The four, fifth and sixth series introduced Stands with a more mechanical and more abstract appearance often trading the humanoid appearance for either more cartoonish or object based stands. Newer abilities followed, changing from elemental, almost magical abilities, to more intricate and specific (manifesting a plane and controlling it, giving life to inanimate objects, creating Zippers on objects to open them). More limitations were put on the abilities as well. Some abilities, however, are outside of the User’s control and often restrict them from movement, speech or another function. There are also Stands capable of acting outside of the will of their User, deeming the name “Automatic” Stands. The Users of these Stands often set commands and are not aware or in control of what the Stand does when it is “out in the field”. Stands share an incredible link with their User. Users can ‘sense’ through their Stand, hearing and seeing up to one hundred times their normal human ability. Stands are not independent beings from their users though, as they relie on them as a battery or source of power. For instance, when Jotaro is suffocated during the beginning of Series 3, his Stand begins to disappear because of loss of breath. Stands also account for their User’s body. If a Stand is injured in a fight, those injuries get carried over immediately to the User. Music plays an large role in the naming of the characters and abilities in the series. Throughout the first two series and most of the third, many of the main characters from the various heroes, allies to villains such as Santana, Kars, J. Geil, Oingo and Boingo have names that can be accounted for by music. By the end of Series 3, Araki began using musical terms for a couple of his final Stands alongside the character, such as Vanilla Ice having an ability known as Cream. In Series 4, the musical references were more focused on the Stands and abilities of the enemies, where there was a fine balance between good and bad Stand Users in Series 5 & 6. What I think is most interesting about Araki’s work, especially Jojo’s, is the insertion of popular culture into his creations. It has always raised the question for me though, is Araki really being influenced by the music around him and is enough of a creative writer to interpret & create his own creations or is his real intention to use these interesting and popular titles to popularize his works and make them, atleast at the time of publication, culturally relevant? Let’s find out, shall we? As I examine a few dozen Stands from Jojo’s Bizarre Adventure!